I've spent most of my life in San Diego County where we have "fire weather." No icy roads, or flood waters banking - we get fire. I’ve spent most of my life in San Diego County where we have “fire weather.” No icy roads, or flood waters banking – we get fire. 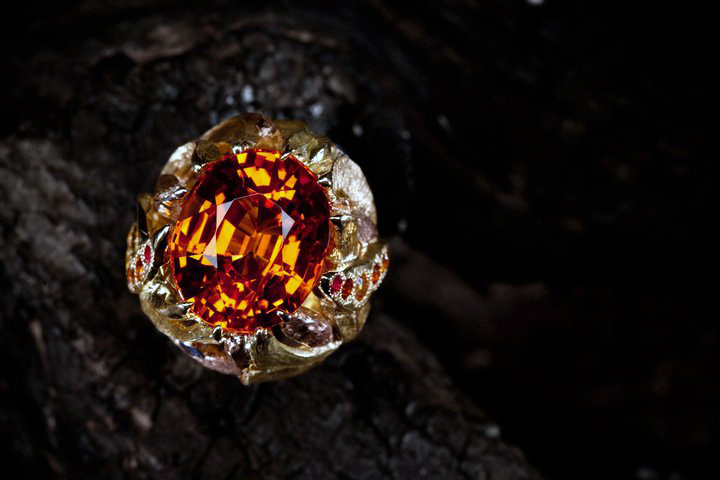 The “Fireball Ring,” featuring a 22 ct. hot orange Spessartite garnet. In October of 2007, I flew to San Diego County to visit my friend and adventuresome client, Mary. We were going to visit the Bowers Museum’s exhibit on gemstones, then play with our own gems. Her worried husband, usually a cool customer, called during lunch. 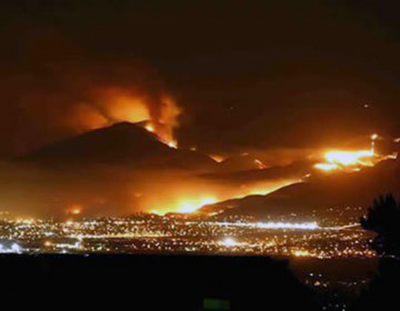 The fires started in East County were moving towards their home. No more chips and salsa – home we rushed. Later that night, we considered what to keep and what to leave watching the wall of flames move closer and closer. That process hones what is important and who the jewels really are. Our three cars caravaned through a night lit by fire. Dunes of ash drifted across empty roads. The world seemed at end. Returning after several days of evacuation, Mary’s family discovered their home was still standing – homes next door were not so lucky. On the left is the final “Fireball Ring” and to the right, is the initial wax carving for. Several gold flames were added after casting. 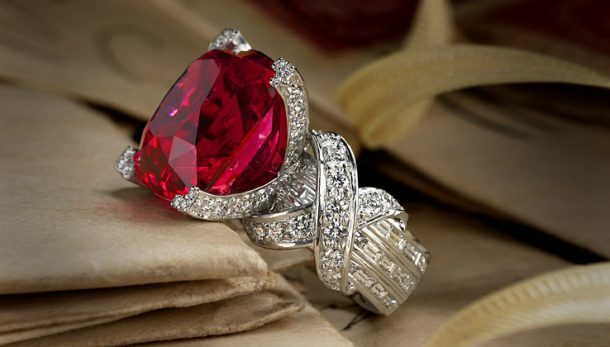 The year before, Mary had purchased a 22 carat hot orange Spessartite Garnet. 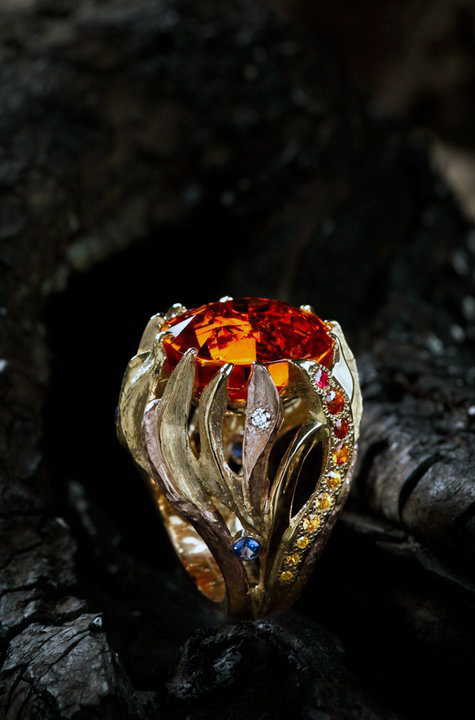 We turned this fireball of a Garnet into a phoenix of a ring to commemorating the family’s trial by fire. They emerged. They were grateful. 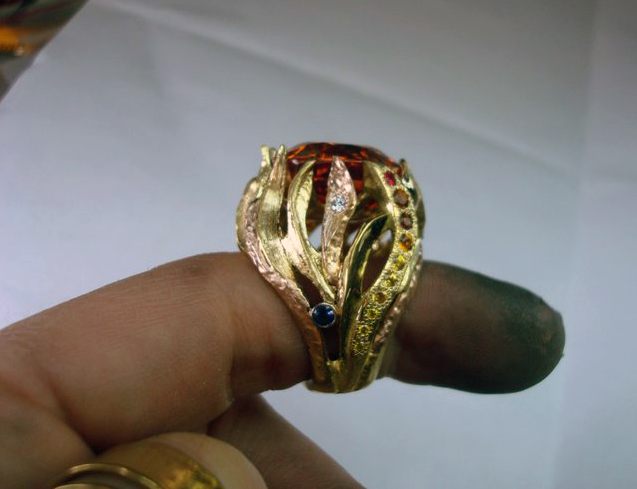 Long flames of 18 kt yellow gold and 14 kt rose gold were applied, some textured. We added a color gradient of Yellow Diamond, Yellow Sapphire, Spessartite Garnet and Red Spinel. Stragetically placed Blue Sapphires, tube set in platinum, quench the heat. Determining the accent gem layout. A view of the fire in San Diego County. 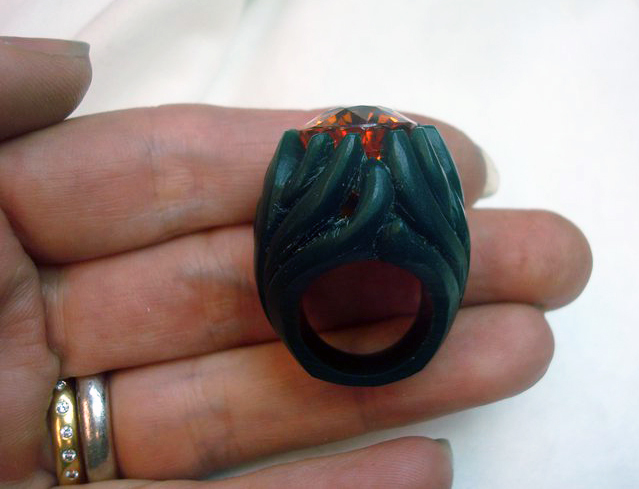 The “Ring of Fire” won Second Place Custom Design Distinction, Vision Awards from Manufacturing Jewelers and Silversmiths of America (MJSA) in 2012. Also enjoy first looks at new jewels and expert insights from Cynthia's decades of experience, giving you a more nuanced understanding of gems and jewels. Welcome to the Cynthia Renée community.